I suppose it shouldn’t come as a surprise that writers at CounterPunch have taken a gloomy view of the recent events in Egypt. They point out that Morsi was Egypt’s first democratically elected president. True, he did win the election, but he did so in a problematic way. Remember that in the first round Morsi only won 24.78% of the vote. In the second round, in which Morsi’s only opponent was Ahmed Shafik, Morsi won 51.73% of the vote. And many people voted for Morsi simply because they didn’t want Shafik, the military’s candidate, to win. 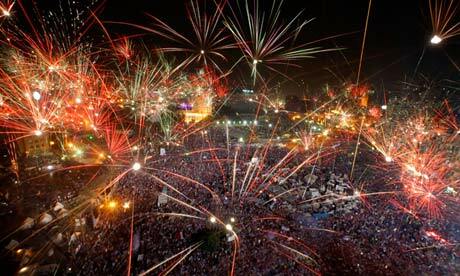 Morsi clearly didn’t have overwhelming support. And once in office, he continued the neoliberal economic policies that provoked the Egyptian people into rising up in the first place. So it should be no surprise that he is now out. The fact that the military has intervened is worrisome. However, it is clear that the military is not the master of the situation, rather it is trying to contain it. The Egyptian people have come too far to return to the days of Mubarak. A lot depends at this point on what the people on the street choose to do next. This entry was posted on July 5, 2013 at 6:46 am and is filed under Anti-Capitalism, Egypt. You can follow any responses to this entry through the RSS 2.0 feed. You can leave a response, or trackback from your own site.